As most people are unpacking their sweaters and coats, the team is rolling out their legwarmers and their cyclocross bikes! With a few local cross races under our belts, we are back at racing! Team Thrive is well represented across all the different races available, from category 4/5 to the elite women’s fields and with both open and masters groups. With three local series available, there is a lot of racing and fun to be had by all here, locally, without having to travel outside of the state! 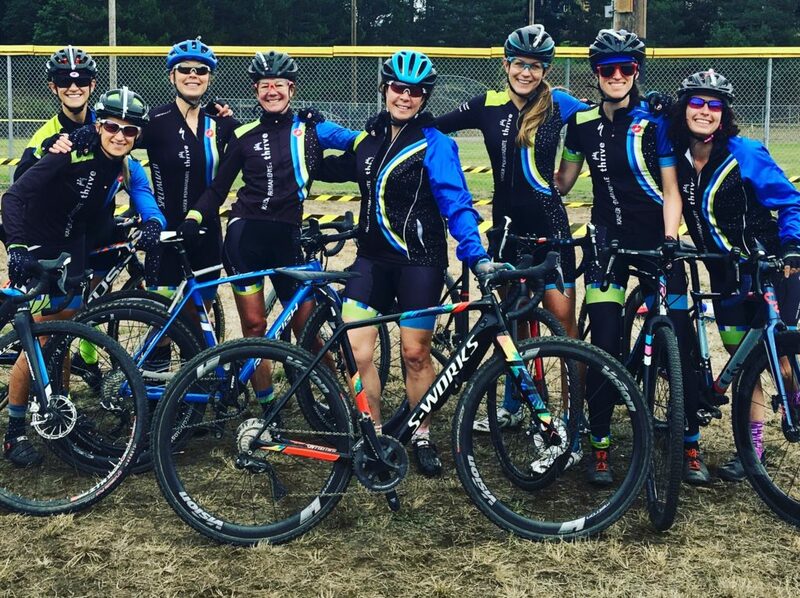 “Cross Our Hearts and Hope for Mud” – Washington Women of Cyclocross Event on 9/15 in Arlington, WA: The season started with our very own sponsored event, the Washington Women of Cyclocross Festival. The goal of the event is “to inspire, educate and connect women to the local cyclocross community, cycling community and active women community”. This mission statement resonates with our team and we are proud to be able to help run this event again in 2018. A warm thank you to all of our sponsors: FSA, Keen, Cairn Brewery, Mad Alchemy, Klean Athlete, Clif Bar, Nuun, Peddler Brewing Company, Dream Clinic, Castelli, Radian Wrench, barre3. Their donations to the event in prizes and crowd-pleasing giveaways made for some very happy podium winners and participants! Women who attended were able to participate in two clinics and over ten races, including some unconventional race categories, like a Mom’s race and a mountain bike race. The local men and juniors were also able to race at the event, with a men’s only and junior boys races to round out the podiums. Local racing continues – Our team is a dominant force in women’s racing on a local level, participating in all of the local races and series, posting several podiums and top ten finishes for our efforts! We are currently entering the midway point for the MFG series–the third largest racing series in the United States. The second local series, Cross Revolution (cross-revolution.com) is a local series dear to our collective hearts – the race promoter helps us execute the Washington Women of Cyclocross (WAWCX) event each year. The only USAC – sanctioned race series (NWCX Cup) is the Saturday counterpart to the local two-day racing weekends, five in total. This series is the brainchild of the local race promoters in their efforts to give racers an opportunity to earn national ranking points—highly important to our racers as we get closer to cyclocross nationals in Louisville, KY on the week of December 11th – 16th. With 3 local race series, US Cyclocross Nationals and Master World Championships in Mol, Belgium, Team Thrive has a lot to look forward to. Stay tuned for our results as we round out the season! « 2018 Road Racing Clinic – February 24th!